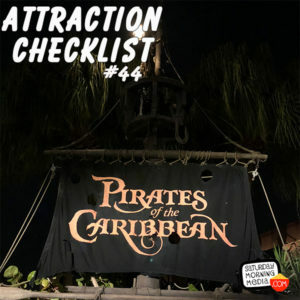 http://www.attractionchecklist.com – Magic Kingdom’s Pirates of the Caribbean at Walt Disney World just reopened after having one of it’s iconic scenes redone. John B. deHaas and I take a ride on it and give you our thoughts on this newly refreshed ride. Recorded on March 21, 2018. Yo ho, yo ho, a pirates life for me. It is time to head to Walt Disney World and experience the recently updated, Pirates of the Caribbean. Located in Adventureland in Magic Kingdom, the guide map describes this attraction in the following manner: Embark on a voyage to a time when pirates ruled the sea. The thrill lever describes the ride as being slow, dark and having small drops. There are no age or height requirements for this attraction and FastPass Plus is available. Now, before we set sail, here are five fast facts about Pirates of the Caribbean at Walt Disney World’s Magic Kingdom. 1. Pirates of the Caribbean opened at Magic Kingdom on December 16, 1973. 2. The attraction features a whopping 126 animatronic figures and 69 of them are pirates. The flume for the attraction contains around three quarter of a million gallons of water that cycles through at about 18,000gallons per minute. 3. The attraction’s theme song “Yo Ho (A Pirate’s Life for Me)” was written by George Bruns and X. Atencio. 4. Over the years several changes to some of the themes in the attraction have been tweaked to stay current with the sensibilities of the time but the biggest change to the attraction came in 2006 when elements from the films the attraction inspired were added to the attraction in the form of a new overall storyline featuring Johnny Depp’s character from the films, Captain Jack Sparrow. 5. In March of 2018, the attraction reopened from a refurbishment with even more changes and the ‘Bride Auction’ scene now featured the pirates selling off goods from the village and the iconic Redhead in the scene is now a pirate herself, who helps keep the rowdy pirates in line. The audio for today’s episode was recorded just a few days after that reopening. Let’s now waste any more time, let’s experience Magic Kingdom’s Pirates of the Caribbean. Along for the ride is John B. deHaas and after we ride we’ll discuss our thoughts on the updated version of the attraction. This is a binaural recording so if you have headphones put them on now as we experience Pirates of the Caribbean at Walt Disney World’s Magic Kingdom!